Flat as a pancake; this leather field holster will protect you and your gun. This leather holster is our original, Sourdough Pancake with the flap sewn to the back of the holster, folded over and snaped to the front of the holster. Made from premium grade, full grain leather, the All American is contour molded and precurved to fit the body for maximum comfort. The pistol is positioned so the trigger guard is covered, grip is out of holster, ensuring a good grip every time you reach for your pistol. Versitle design that can be worn on our Chesty Puller Straps, your belt, strong side or cross draw. 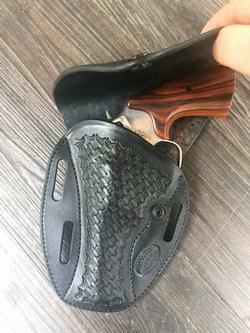 This is the flattest flap holster we have ever used, it is very comfortable and not too conspicuous. If you don't see your particular gun listed, please use our Contact Page to inquire about available guns.